Size of Common Redstart. 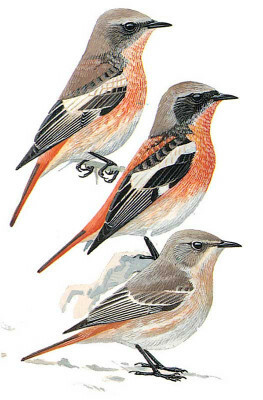 Brightly coloured male told from other redstarts by broad longitudinal white patch on wing-coverts (including primary-coverts), rusty red mantle and most of underparts, including throat; crown to hindneck whitish grey, black sides of head extends to shoulder. In winter both adult and 1st winter male (which has also white in wing) has browner grey crown and red parts fringed whitish. Grey-brown female told from similar Common Redstart and Black Redstart by Spotted Flycatcher-like whitish wing-bars and edges to tertials. Does not shiver tail like Redstart but jerks tail up and down.